Balaboosta (n.)(bah-lah-b00-sta) A Yiddish term meaning the perfect housewife, homemaker, wonderful mother, cook, and gracious hostess. She does it all and does it well. 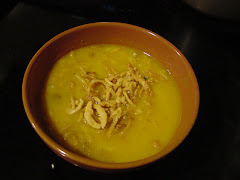 I make simple food with easy recipes and I like to try new things. 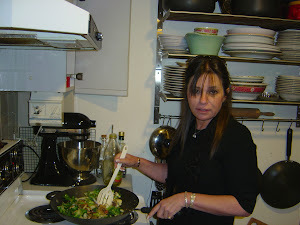 My family and friends love my cooking and always ask me to share, with them, what I know about food, flavor, and technique. I'm not a professional chef and I've had no formal culinary training. 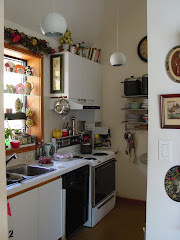 What I know and do in the kitchen comes from three women...Nana, Grandma Della, and Rose, my mom. Each one of them knew more about putting a meal on the table than any fancy chef in a white hat. They were the ultimate Balaboostas. What I offer you is a lifetime of experience in the kitchen with my compliments and theirs. I hope they'd be proud. I will bring you my recipes as I make them with photos of the actual food I'm preparing. I'm no professional photographer either but I promise, my food will speak for itself in every picture. The food on my table isn't stacked in a trendy tower. Instead, my food is stacked with flavor and full of my passion for cooking. So please come in, make yourself comfortable, and enjoy. To see amazing detail in any photo just click on it! Disclaimer: While most of my recipes are "Jewish Style", I do sometimes cook with pork. 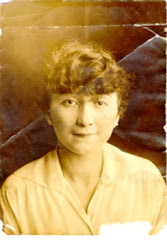 This might have been a great disappointment to some but my grandmothers knew that I live in modern world. I light Shabbos candles religiously but I have to admit...I do not keep a Kosher home. 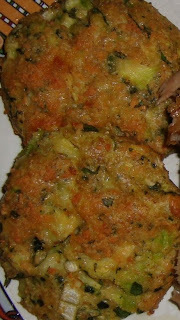 This recipe for Zucchini Cakes was created one afternoon as I was making my Stuffed Zucchini recipe. I accidentally destroyed the skins of the zucchini as I was scooping out the flesh. In my frustration I decided to continue chopping up the entire vegetable, skin and all. Instead of filling the hollowed zucchini shells with the prepared mixture, I formed cakes instead and baked them just as I would with salmon or crab cakes. I usually opt for the healthier baked method but if you like your food fried, these cakes are equally delicious when finished in a frying pan with a small amount of olive oil. 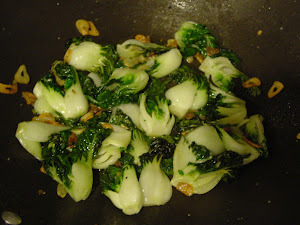 Either way, the result was another wonderful vegetable side dish. This could even been a great main course served with a tossed salad. Easy applies here. Measurements are approximate and you don't have to be exacting. Cut off the light green end of the zucchini. Using tongs, place the zucchini in the simmering water, cover, and set your timer for 7 minutes. 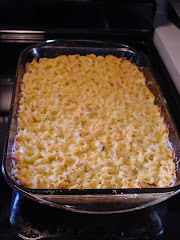 Meanwhile...in a medium bowl, blend the eggs, bread crumbs, minced onions, and 1/2 cup of grated cheese. When the zucchini is done simmering...using tongs...remove it from the pan to a cutting board. Allow a couple of minutes to cool for ease in handling. Slice and then thoroughly chop the zucchini. Add the chopped zucchini to the bread crumb mixture. 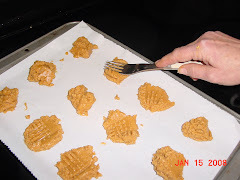 Form small cakes and place them on a greased (or sprayed) foil lined baking pan. Top each cake with some grated parmesan. Bake at 350F for 30 minutes or until the cheese begins to turn golden. Optional Frying...If you prefer pan frying, bring a skillet to medium heat. Add a couple of tablespoons olive oil. Cook 4 minutes on each side or until golden brown. 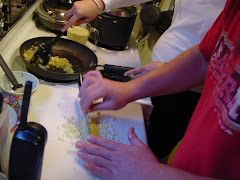 Add final grated Parmesan as a garnish. This recipe makes 6 small cakes. 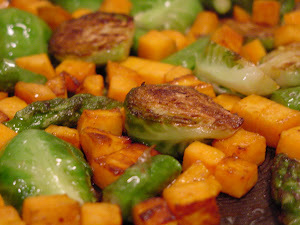 I am doing this with patty pan squash. Enter any word i.e. apple, soup, cheese, etc..
Amish Cooking at it's BEST! Visit Sherry Gore's Website & Win a Copy! Get Healthy - It's about making choices. Cranberry Pecan Lace Cookies - Can be low cal! Nana's Apple Cake - Sugar Free! Sweetie Pie Potato - "My Sweetie Pie" Casserole - A Thanksgiving Favorite! 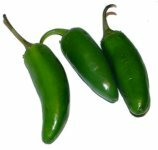 Jalapeño Peppers add flavor to Guacamole! Time saving hint! I buy my ribs at the local warehouse club and they sell 2 huge racks per pack. When I get home from the store I cut each rack in half and boil them immediately. Then I freeze the par-cooked halves we're not eating that night. Lay the two halves side by side, one facing up and one facing down, in a zip lock bag. Fold the bag over so the ribs spoon with each other. That way there's plastic between keeping them separate. This will shorten the defrost time when we're in the mood for ribs again. Half the cooking is already done! Use a small non stick frying pan on medium heat. Put a one layer portion into the pan. Cook, tossing frequently for 5-6 minutes or until you can see the nut just getting slightly browned. Remove from heat. Pour hot nuts onto a plate to cool. When completely cooled..store in airtight container. Hummus is made of only a few ingredients. When you really examine it, Hummus is made of 60-70% water. Other than water the most important ingredient is tahini (a paste made from ground sesame seeds). The tahini is mostly fat but this fat is a good one. It contains those omega-3 fatty acids that have proven to be beneficial in the control of cholesterol. Hummus is quite satisfying and does not raise the blood glucose level very much making it a good dietary choice. Portion soup 2 full ladles per zip lock sandwich bag. Remove excess air from the bag as you seal it. Lay these soup bags flat on a cookie sheet. Slide the pan into your freezer overnight. 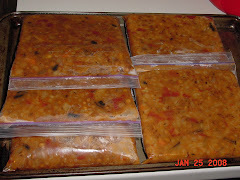 Next day remove the pan and put the individual serving bags into a larger gallon size freezer bag. Store frozen soup for months. Enjoy a hot bowl of soup at a moments notice. Anytime. Cumin and Garlic give this stir fry a deep rustic flavor. ...cooking with your best friend! Born April 21, 1954, Brooklyn, NY. Graduate 1977 University of Miami - School of Nursing, Coral Gables, Fl. I’ve been fortunate to have many interesting and fulfilling jobs BUT THE BEST JOB OF ALL has been raising my two outstanding and very special children. They continue to be the best part of my life. I loved playing with them, teaching them to love, cooking for them, and packing their lunches. I'd do it all over again, if I had the chance. Fast , Easy, and Delicious! Look at the size of these! 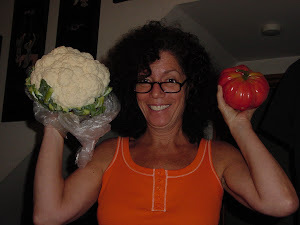 These are the largest tomato and head of cauliflower I've ever seen. Gently press down with fork..
...to create the traditional crosshatch pattern. With fried onion ring garnish.